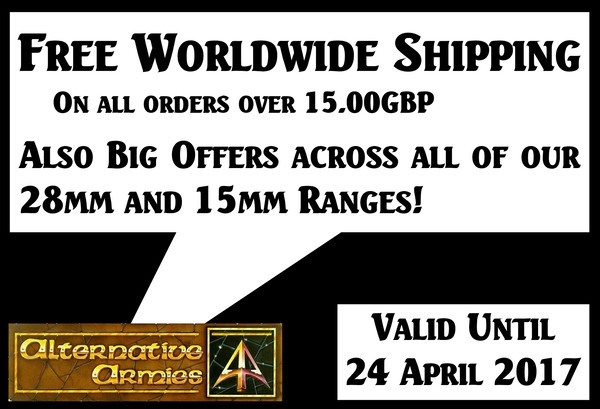 We are delighted to release the new miniature code for April 2017 now at Alternative Armies for Flintloque. 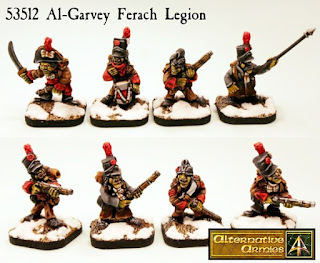 The 53512 Al-Garvey Ferach Legion who are at this time the first and only Goblins to fight on the side of the Ferach Emperor Mordred. Eight new poses in campaign dress sculpted by Elton Waters which can be had as singles, a pack and a unit for Slaughterloo too. On top of this we have a new free PDF which is a combined one. 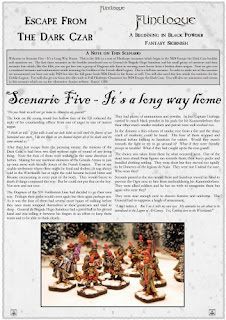 The fifth scenario in a loose chain for 5024 Escape the Dark Czar which also includes a uniformation article with statistics for the Goblin Legion miniatures. Go HERE or read on for me. This code contains white metal 28mm scale miniatures in varying amounts depending on your choice of pack. Taken from eight different poses. Goblins dressed in line infantry uniforms and armed with Regency Muskets as well as Sword and Pistol. An officer, a Standard Bearer, a Musician with Drum, a Sergeant and four different poses of Private with musket. 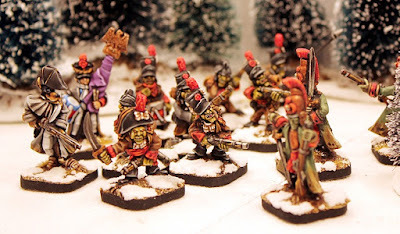 These miniatures are in campaign dress wrapped against the cold and the elements and are brimming with character making a superb skirmishing set. This set is available in several choices. These are the Skirmish Pack which contains all eight poses plus two random additional troopers with musket. The Unit Pack which contains everything in the skirmish pack plus ten more mixed troopers armed with musket for a total of twenty (a full Slaughterloo unit). The Trooper Booster which contains one random trooper with musket (if you wish command poses just note this in an email to us with your order number). These options can also be selected as Pro-Painted and Based all using the drop down menu on the product page. These miniatures are supplied with our 25mm square resin cartouche bases. Manufactured in Scotland. Go HERE. There are a huge number of free PDF files for Flintloque and Slaughterloo plus the rest of our game systems and while we can send you a list of them to choose from if you email us on sales@alternative-armies.com but you can also get them as a big free download from a link HERE on the Flintloque page of the website. 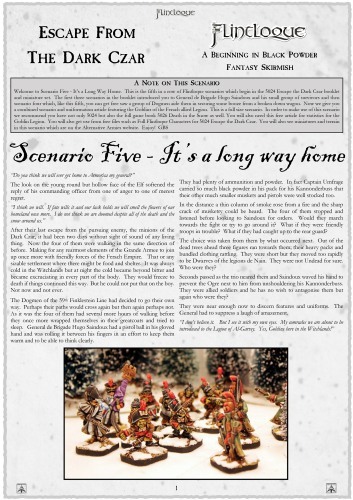 We have a new free PDF combined scenario and article which you can download from our dropbox right now by CLICKING HERE. 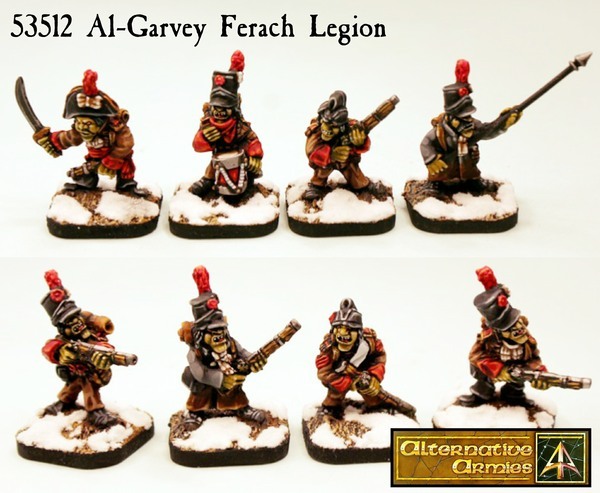 Scenario Five called 'It is a Long Way Home' which sees the Ferach survivors from 5024 Escape the Dark Czar (the starter set for Flintloque) team up with the new Al-Garvey Legion to fight off the Undead. It also has a Uniformation article giving uniforms, background, statistics and more for 53512 Goblin Ferach Legion included. Enjoy! Lastly. Our Salute Special Week will begin officially on Friday with full details across all ranges then...but the offers have already been put in place as of now so that you can order your Flintloque and Slaughterloo miniatures and books now and the deals too! Check out the Von Rotte Legion divisional army pack which is a massive 25% off during this promotion period (awesome value and our Salute Valon deal!) and all orders place for more than 15.00GBP of product value automatically get free worldwide shipping!